It has been a very hectic, crazy and fun week in our classroom! 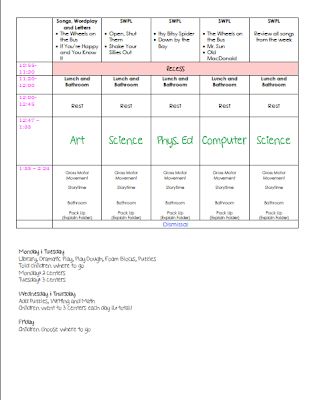 It is probably too late for most of you to use this year, but I wanted to post my lesson plans for the first week of school to give you a taste of what we are up to. Please remember that our students are FOUR when they come to school. Many of them have never, ever been to school before so we need to keep it super simple and very repetitive. I also highly recommend finding a format that works for you and doing all of your planning on the computer. For my first two years of teaching I hand wrote everything. 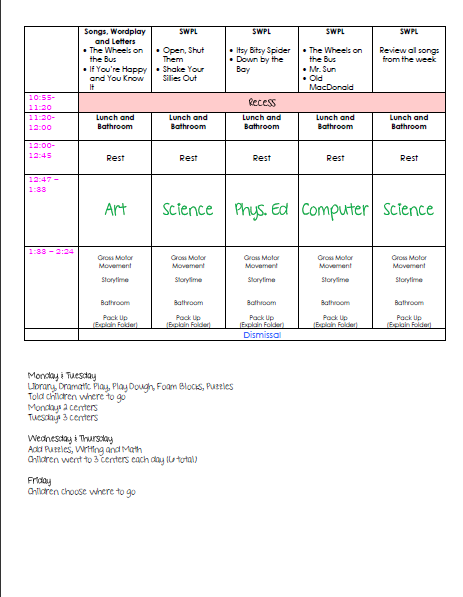 It is SO much easier to copy and paste my plans from last year into my new format each year. It saves me tons of time, and I can easily adjust and tweak my plans to suit my students. I simply used Microsoft Word and created a table that works fabulously for me. I know that this is a little hard to read, so feel free to download the PDF (for free!) at my TPT Store. *We use the Opening the World of Learning (OWL) curriculum. We do not use it for the first two weeks of school in order to establish routines, explore the environment and learn how to care for materials. OWL Centers are our developmentally appropriate version of literacy centers. *All of the books we read this week are about the first day of school, or about separating from loved ones. If you have never read Owl Babies, you should! It's perfect for kindergarteners who have a bit of separation anxiety. Usually we have math centers in the afternoon, but we will not be starting that until next week. *For the first week, we will read an additional book that goes along with our theme and do some gross motor movement instead. This gives us an opportunity to help students stay organized and practice packing up. I have found that this pays off in the long run and helps them to become independent much more quickly. *Songs, Wordplay and Letters, lovingly referred to as SWPL (pronounced swipple) is a great opportunity for phonemic awarness and other emergent literacy skills. During the first two weeks, I teach two new songs per day. We practice each song about three times. The first time, I sing it very slowly and they do the accompanying hand motions. The next two times we do it to music. We also review the songs on and off throughout the week during transitions. I hope that this is helpful... I would love to answer any other questions that you may have! Love your blog!! I came across it through TBA. Thanks for all the great tips!